Welcome back from the Chinese New Year, hope you all had a fulfilling holiday! Valentine’s Day is around the corner! Racking your brain about the gift for you beloved one? Don’t know how to express your affection to the person of your heart? The ART-ivity team is here to help. We are hosting a Paper Flower Workshop to celebrate the day of love. 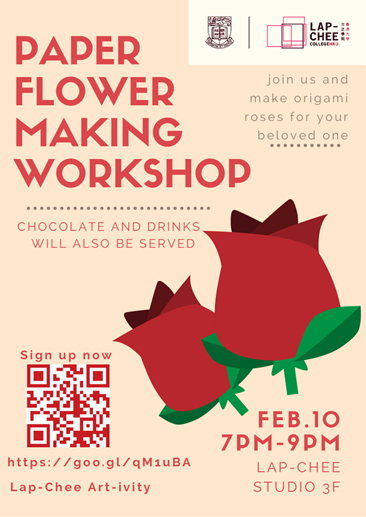 Material and guidance will be provided for you to make origami roses and calyxes. Snacks and drinks will also be served! Come and join us to enjoy the fun of paper-folding! We have 30 quotas only on a first-come-first-served basis, so sign up as soon as possible! A confirmation email will be send to you once we have saved your seat.